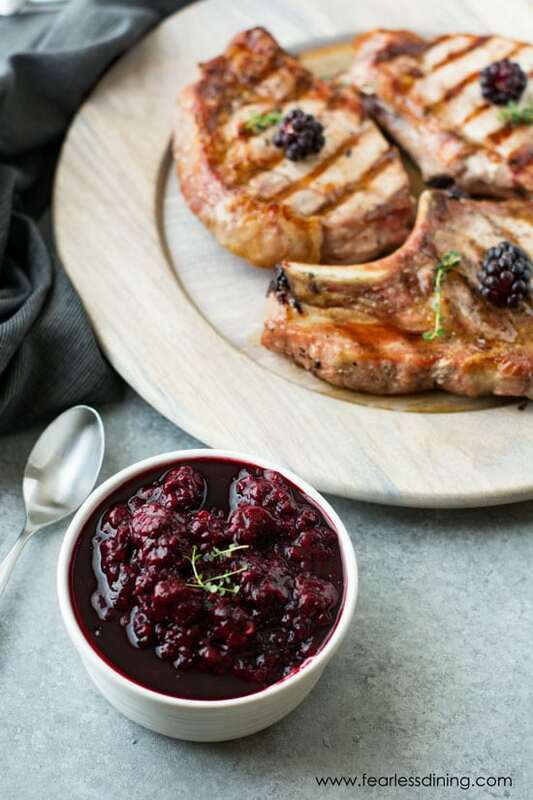 These delicious, thick grilled pork chops with an olallieberry thyme sauce are a deliciously easy dinner that the whole family will love. 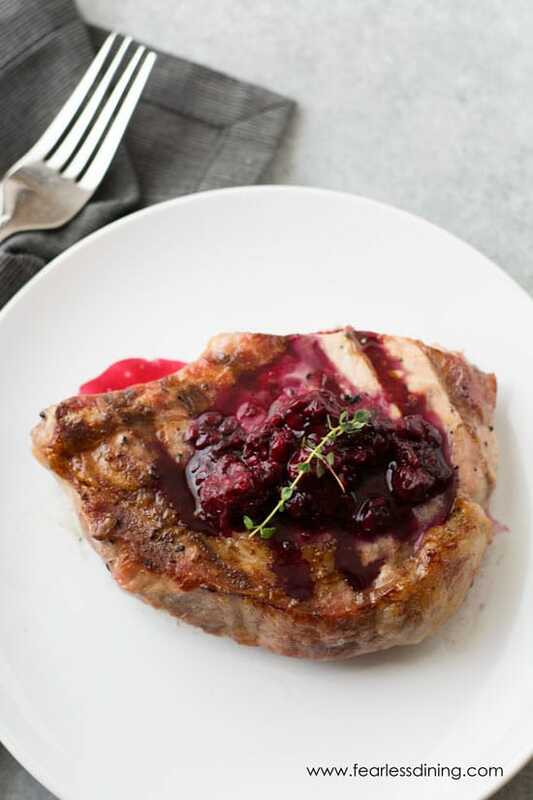 Humanely raised organic pork chops are juicy and delicious. Olallieberries are in season for such a short time, if you see them grab a pack or two! It is summer and grilled foods are always our go-to dinner. Do you grill a lot during the summer too? I hate cooking inside because it heats up our whole house. Houses in the Bay Area really didn’t need a/c years ago, but thanks to global warming, it gets hot here now. Hello, 108 degrees that we had last week! That is totally not like our usual weather. So, the grill it is so I can barbecue these pork chops! 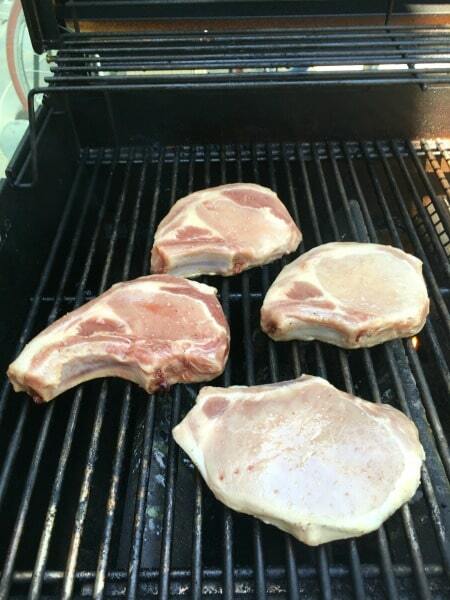 These thick and yummy organic pork chops are from a fun meat vendor at our farmer’s market, Prather Ranch. You can buy all sorts of meats at their booth. (This is an unsolicited plug!) They pair perfectly with fruit. They also have a small take away restaurant and sell their meats in the Ferry Building in San Francisco. 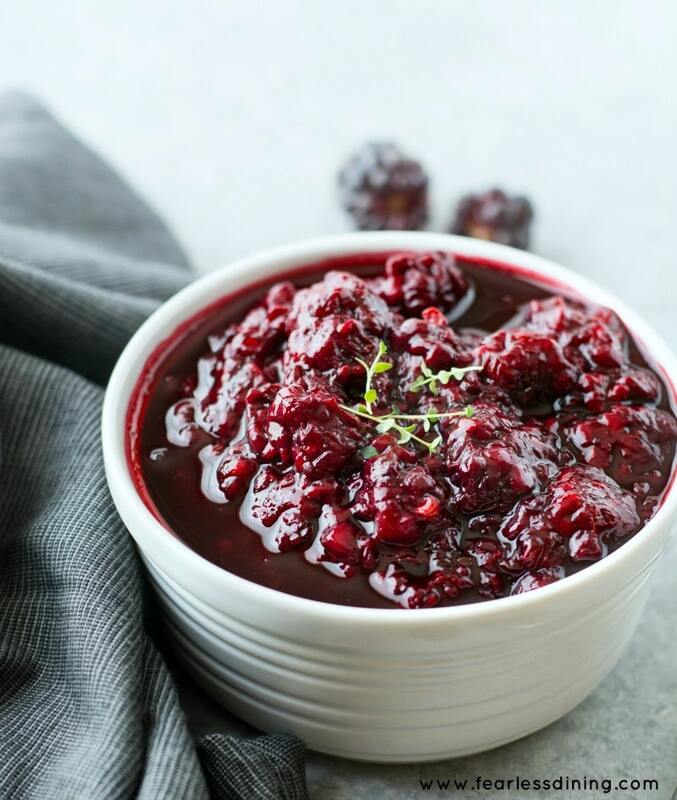 Here is the recipe for the yummy Olallieberry Thyme Sauce! Gob it on and enjoy…this sauce is awesome in crepes too! 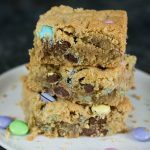 This recipe is gluten free, paleo, and Whole30, so no guilt!! 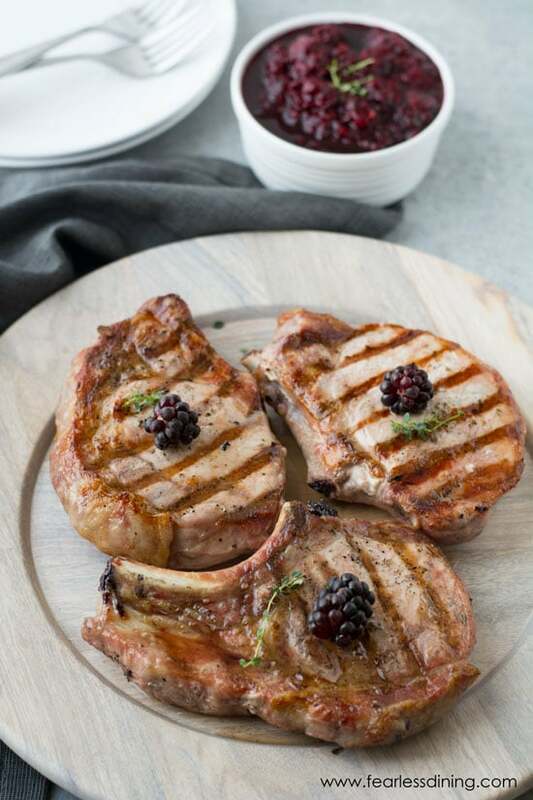 Fire up your grill so you can BBQ these awesome pork chops :-). Fire up your grill for these easy grilled pork chops! Rub pork chops with salt, pepper, and olive oil. Grill both sides until the internal temperature reaches 165 degrees. Top with the olallieberry thyme sauce. 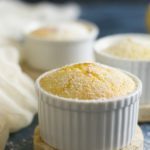 Yummy Gluten Free Recipes To Try! Just love pork with something a little sweet. 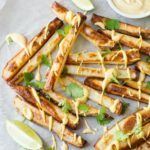 Fun little summer grilling recipe! Definitely 🙂 Thank you so much. 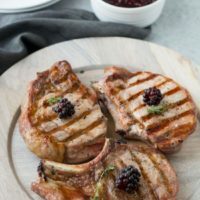 Yum – I love pork chops – have to try this! You have me excited about getting the pork chops I have out of the freezer! What a delicious sauce too! Your sauce looks amazing! And I must say, I’ve never heard of olalliberries before! What a fun discovery! 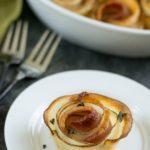 My husband LOVES pork so this is definitely going on the dinner menu for next week! Looks amazing!! I don’t know where I have been, but I’ve never even heard of Olallieberries! Your sauce sounds delicious. I will now be on the lookout for Olallieberries. 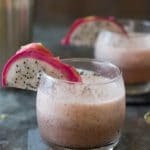 If you don’t see them, blackberries also work in this recipe :-). Oh my! That sauce sounds and looks dreamy!